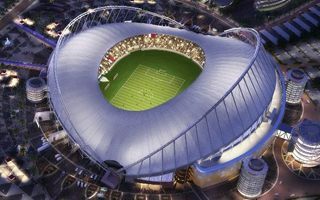 The Qatari Supreme Committee for Delivery and Legacy (SCDL) has confirmed that Khalifa International Stadium will not be ready by the end of 2016, as was announced back in 2014. With just over a month remaining it’s now clear that not all works will be complete by year end. New deadline is estimated for “first quarter of 2017”, suggesting no later than March. With several years remaining until the 2022 World Cup, such delay will of course bear no impact on the FIFA tournament. Khalifa Stadium, until recently the largest and national venue of Qatar, will lose its status to Lusail Stadium. It will also lose some 10,000 seats of the previous seating layout, becoming one of Qatar World Cup’s smallest venues. One title the stadium will still hold is the tallest stadium in Qatar. Since its second arch was completed in June this year, it measures 120 meters from ground level. Both the arch and cable roof supported by it are now in place, while installation of membrane canopy should end within weeks. The SCDL said that construction is moving at a rapid pace, with external cladding and LED screens coming up around the exterior of the venue.